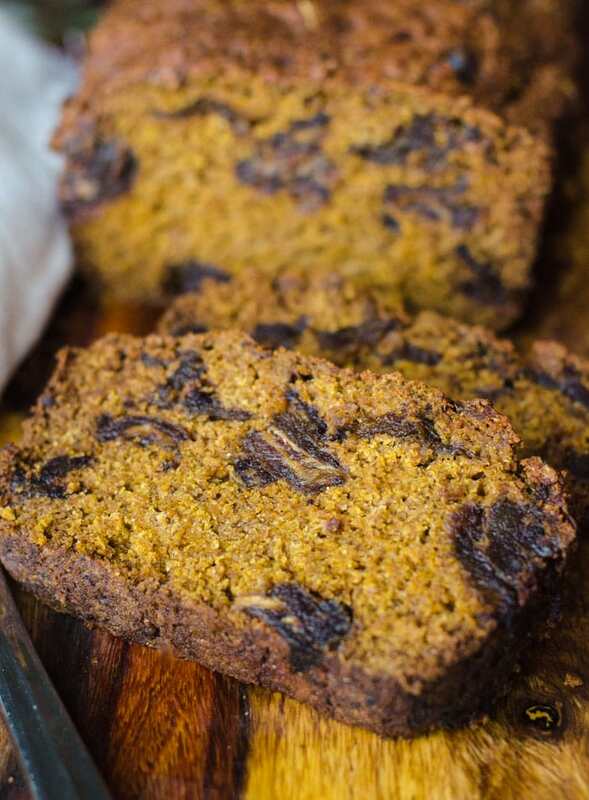 I don’t share baking recipes around here too often so today is a special day: I present to you Vegan Pumpkin Date Bread. As soon as cooler weather hits I swear all I want to eat is dates and pumpkin. Whether that’s in a sweet or savoury recipe doesn’t matter, I just love those two ingredients. 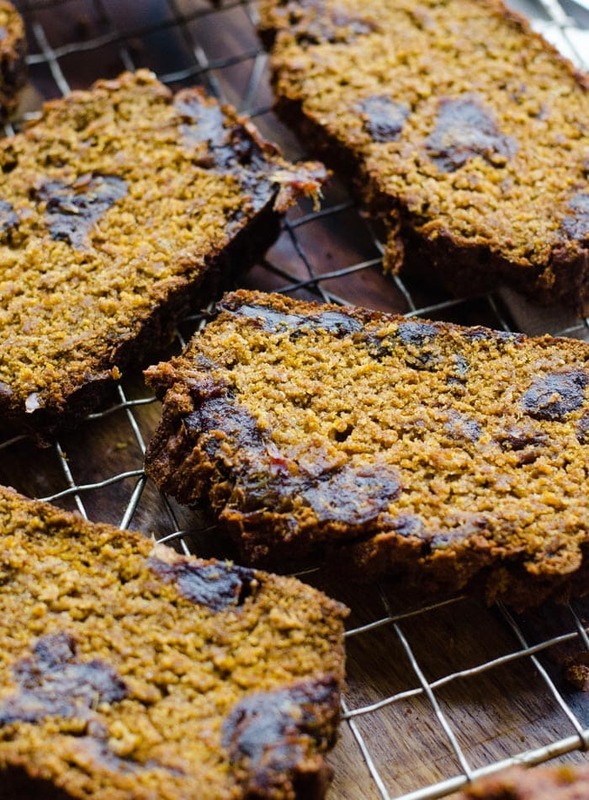 Today they’re coming together in this pumpkin date bread made with spelt flour, coconut sugar and coconut oil. 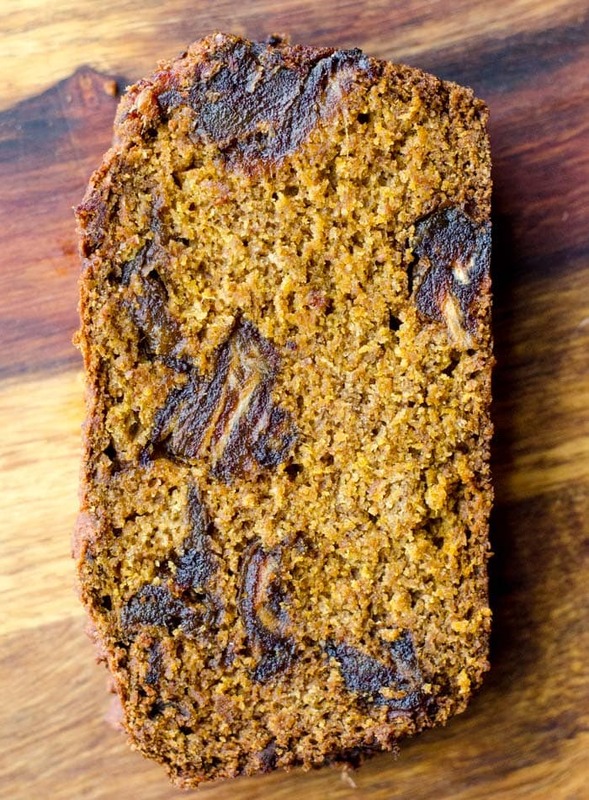 With ingredients like pumpkin pie spice, dates, pure pumpkin puree and coconut sugar, this wholesome bread tastes like a caramel pumpkin pie. 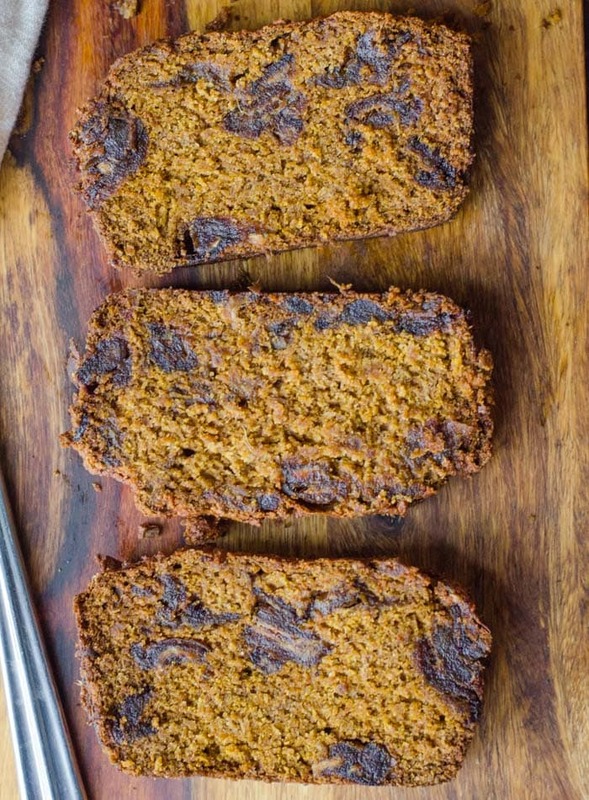 To best enjoy it, slather a slice warm from the oven in coconut butter and whisk yourself off to pumpkin date heaven. My favourite way to enjoy this bread is slathered in a generous serving of homemade coconut butter. Coconut butter, or sometimes called coconut manna, is simply coconut that’s been processed down to a paste. My favourite things about it is its texture and intense, rich coconut flavour. It’s so goodMaking your own coconut butter is really easy and it’s a fraction of the cost of buying it at the store. If you can grab some unsweetened shredded coconut or coconut flakes on sale, stock up so you can make a big batch of inexpensive coconut butter. I find coconut flakes yield the smoothest butter but any kind of unsweetened coconut will work. Add about 4 cups of unsweetened shredded or flaked coconut to a food processor or high-speed blender. You can use more or less than that but I find if you use too little it’s hard to get it to blend. I’d say use a minimum of 2 cups but you’ll have an easier time with 3 or 4 cups. Process the coconut, stopping to scrape down the sides as you go, until it forms a thick paste. This can take anywhere from 10 to 20 minutes depending on the temperature, the brand you use and your food processor or blender. Be patient, it’s well worth the wait! Once it has a grainy, peanut butter-like consistency, scoop it into a container with a lid and store at room temperature. I’ll sometimes add a pinch of sea salt and maybe some vanilla but it’s not necessary to add anything. It’s absolutely delicious on it’s own but feel free play around with any add-ins you can think of. You can use coconut butter in smoothies, baking, on pancakes and waffles, on toast, stuffed into dates, spread on muffins, with sliced apple, in sweet potato breakfast bowls, or even just on it’s own straight from the jar with a spoon. 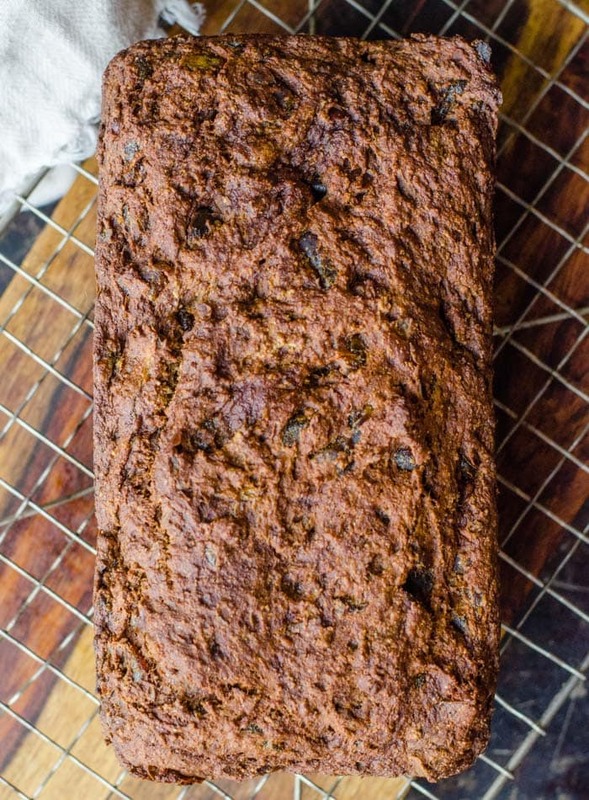 Oh, and slathering in a thick, thick layer over a piece of this vegan pumpkin date bread. Lately I’ve switched over from flax eggs to psyllium husk to use a replacement for eggs in baking. Both are good options but I really like the gel that psyllium creates when mixed with a little water. Plus you only need about 1/2 tsp to replace one egg. Both are good options though so if you don’t have psyllium husk, you can use 1 tbsp of ground flax in it’s place. 1 Egg = 1/2 tsp psyllium husk + 3 tbsp warm water. Mix together in a small bowl and let thicken for 3-4 minutes. Spelt is a ancient grain in the wheat family and although it’s not the same as wheat, it does contain gluten which makes it a good substitute for regular wheat flours in baking. 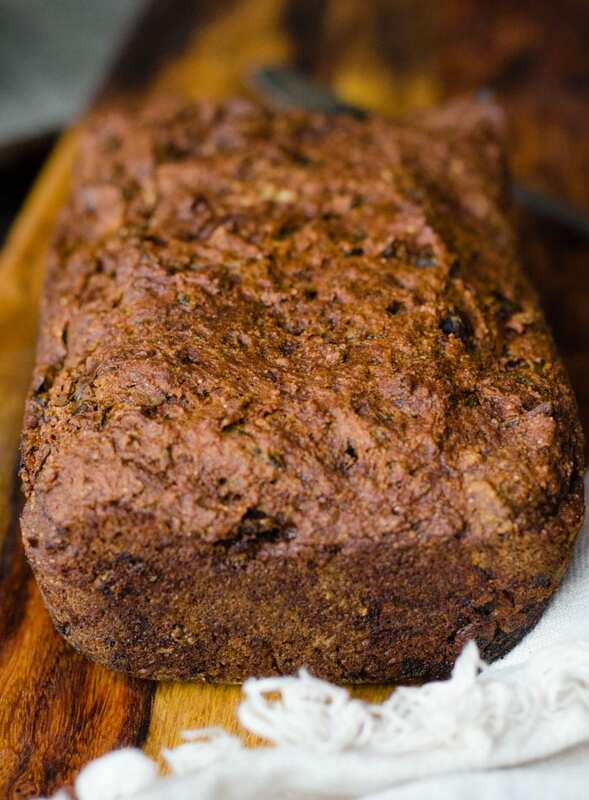 Spelt has a unique nutty and subtly sweet flavour which works well in baked goods. I find it’s really easy to work with can pretty much be used in place of whole wheat or all purpose flour across the board. Spelt is easily digestible so some people with wheat intolerances may be able to tolerate wheat but keep in mind it’s not a gluten-free flour. It is however a good source of fibre, iron, manganese and magnesium. 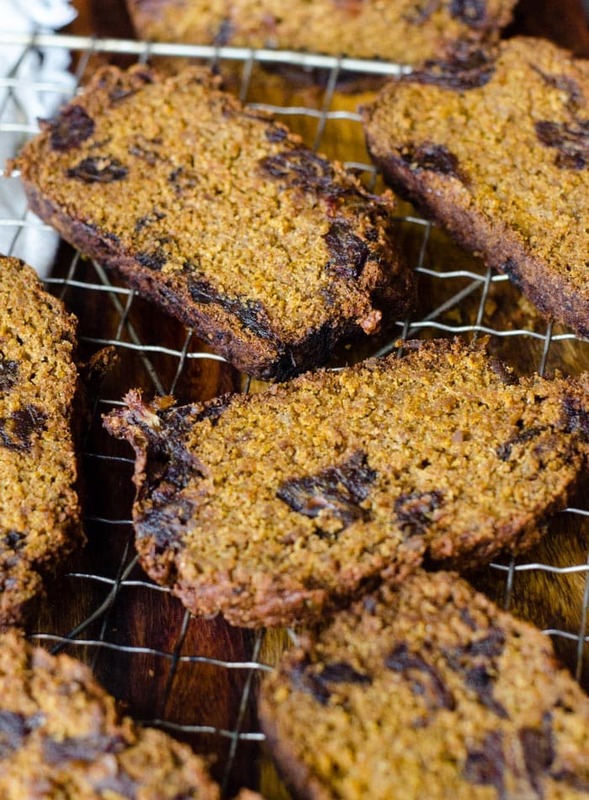 I like using Spelt Flour for the whole grain nutritional benefits, the flavour and the ability to replace wheat flours without worrying too much about ruining whatever I’m baking by going gluten-free. 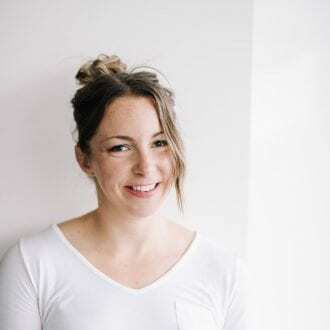 I’m not that familiar with the ins and outs of gluten-free baking and it can be a bit tricky if you don’t uses the right flours and additional binders like xanthan gum so spelt flour is a good choice for me when I’m baking. 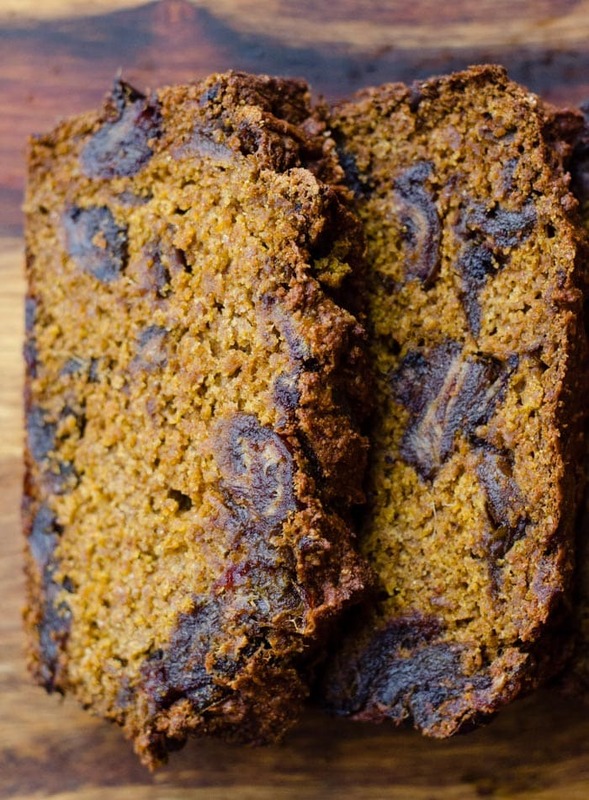 About this beautiful pumpkin date bread. With sweet, caramel dates studded throughout the pumpkin batter, the final result tastes like a caramel pumpkin pie. I don’t know if that’s a thing but it definitely should be. It’s highly addictive, the perfect cozy Fall food, smells amazing, has a nice crunchy crust and soft, gooey middle and is just asking to be topped with almond butter and banana, or all that coconut butter we talked about. You guys are going to love this bread! It’s so, so good. I cut my loaf into 12 slices making each serving 200 calories with 40 grams of carbs and just 4 grams of fat. Each slice has 3.7 grams of protein and 5.8 grams of fiber. This isn’t a recipe I’m going to go on about nutritionally though. I mean it’s made with sugar and flour, not two ingredients we eat for their health benefits. This one is about the taste and the love, with a bit of a healthier twist. I hope you enjoy it. 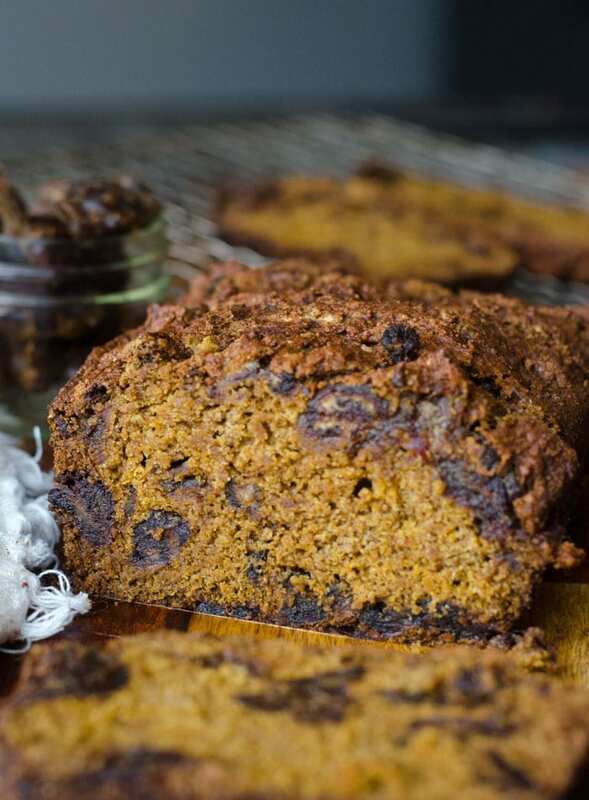 This Vegan Pumpkin Date Bread is delicious, cozy and just about perfect for Fall and Winter mornings. Try a slice warm from the oven slathered with coconut butter for the ultimate comforting sweet treat. Refined sugar-free, egg-free, soy-free and dairy-free. Place the chopped dates in a bowl, pour boiling water over them and set aside for about 10 minutes. Mix the psyllium and water in a small dish and set aside for at least 3 minutes. Mix the flour, sugar, baking soda and sea salt together in a bowl. Mix the milk and apple cider vinegar together in a small bowl. Add the milk and apple cider vinegar mixture, psyllium egg, melted coconut oil and pumpkin to the dry ingredients. Drain the dates and add those too. Fold together gently, do not over mix. Scoop the batter into a lightly oiled loaf pan and bake for 50 minutes. Let sit in the pan for about 5 minutes. Flip out of pan and let cool completely before slicing. Store in the fridge, freezer or at room temperature. For best results, use a kitchen scale to weigh ingredients according to recipe. This recipe is simply wonderful. Simple and is a delight, I can do and recommend. Thanks for sharing. It’s one of the best recipes I’ve ever had in my life, I came to this site, I liked it and decided to put it into practice and it was delicious, I recommend it and I ask you to continue with the beautiful and good work. I have never cooked with most of these ingredients. This sounds super awesome and if I could trade out the pumpkin for something else (I’m allergic) I would totally try it! Bread is so delicious! This bread looks so delicious, I love anything pumpkin, especially in the fall. I’ve never had coconut butter, but after reading this, I would love to try it. This looks absolutely delicious! It’s so nice to find great vegan recipes out there! A great fall treat with a cup of hot tea! It looks so yummy, i will add this to my snack collection and the best part is its easy and quick recipe yet its delicious :)). Thank you for sharing! That bread looks and sounds amazing. I agree with you – if caramel pumpkin pie isn’t a thing, it definitely should be. Seems very tempting. I have taken a snapshot of the recipe and shared this post with my wife. Will relish the outcome soon. Haha !! Thanks for sharing. this looks amazing… i would love to make this, it would be a perfect addition to our meals in our house! Your photos are gorgeous. I love that this recipe is vegan and perfect for fall. This recipe looks so delicious and amazing!!! I love dates and I love pumpkins — to combine the both of them is a dream come true! I want a slice for two right now, please! OMG my husband loves this loaf!!! Have to make at least every other week! That’s awesome. So happy to hear that! !